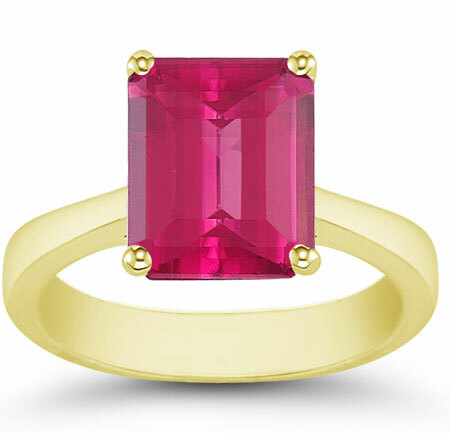 Fall in love with the lovely pink topaz of this emerald-cut pink topaz solitaire ring in 14K yellow gold! The brilliant, almost sunset pink of the authentic AA rated Gemstone from Apples of Gold Jewelry will bring a little color into your life. The emerald-cut solitare pink topaz gemstone is 8mm x 6mm and features an emerald-cut. The bright pink of the pink topaz set against the soft yellow gold ring creates a contrasting color combination that will add extra romance into your life, especially as part of a bridal set! We guarantee our 8mm x 6mm Emerald-Cut Pink Topaz Solitaire Ring, 14K Yellow Gold to be high quality, authentic jewelry, as described above.